Products or brands now live or die by the promise and execution of service. With quick commoditization and shrinking margin as a fact of business life, companies are choosing to differentiate via service offerings that could be more difficult to replicate. Since service is intangible, the challenge of services involves understanding unmet needs and formulating an innovative idea to the market to differentiate the brand. Case Studies: Airline, Automobile, Bank, Bed, Car Rental, Car Repair, Cement, Computers, Coffee, Courier, Diagnostic Tests, Dolls, Drugstore, E-Book Readers, Education, Electronic Repairs, Engine, Energy, Fashion, Fast Food, Financial Services, Fitness Center, Furniture, Gov’t service, Health gadgets, Hotel, Insurance, Magazine, Outdoor Advertising, Paint, Pharmaceutical, Personal Grooming, Plastic, Restaurant, Retail, Shoes, Solar, Supermarket, Telecom, Tools, Toys, Used Car Sales, Video Games, Video Rental and Wet Market. Chiqui Escareal-Go is author/co-author of 5 marketing and entrepreneurship books. She is an Executive Scholar for Marketing and Sales, Kellogg Business School (Northwestern University) and took advanced marketing programs at Harvard Business School, University of California (Berkeley) and Columbia University (Ceibs). She is vice president of the Women’s Business Council Philippines, a member of the board of trustees of St. Paul College Pasig and Kythe Foundation, Inc. and was recognized as Outstanding Filipina Entrepreneur 2011 (Trailblazer Category). 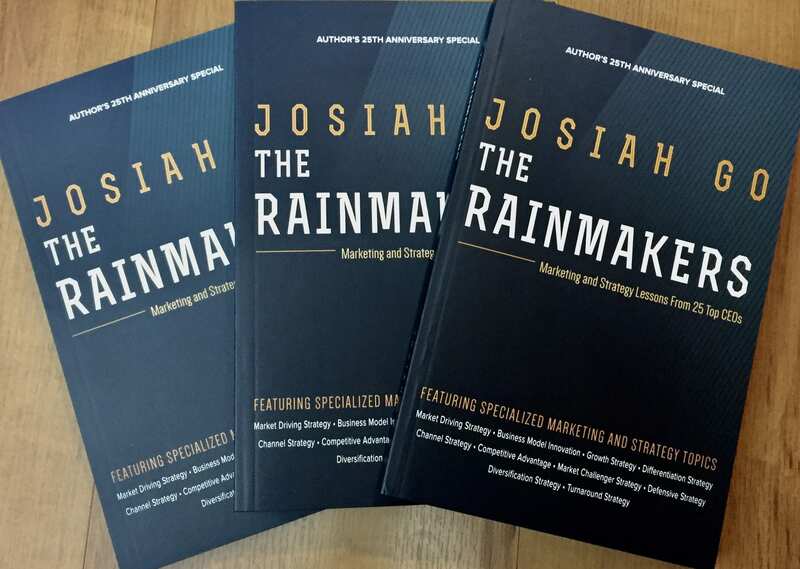 Josiah Go is author/co-author of 13 bestselling books on marketing, sales and entrepreneurship. He is chairman and director of 12 companies and is the first and only Filipino to be awarded one of Ten Outstanding Young Persons (TOYP) of the world in business education, in a search among 1,000 Ten Outstanding Young Men (TOYM) from over 100 countries.